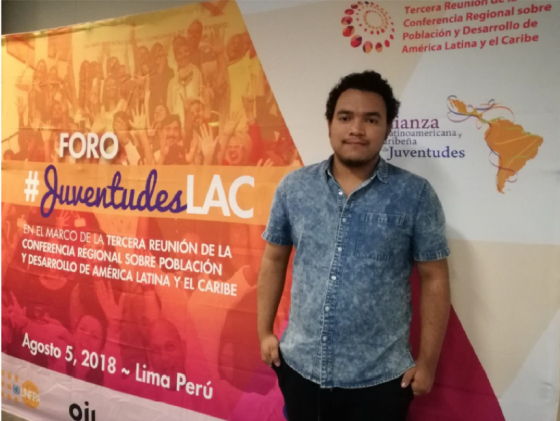 Alessandro Roldán, one of our Fellows from GOJoven Guatemala, recently traveled to Lima, Peru, for the Third Session of the Regional Conference on Population Development (CPD) in Latin America and the Caribbean. In addition to attending the high-level CPD meeting, Alessandro also attended some pre-conference Forums with civil society members, as well as the pre-CPD youth camp sponsored by UNFPA, called ¡Juventudes Ya!. One of his biggest takeaways from this experience was that young people are united in their struggles to achieve recognition of their political, cultural, social and sexual identities, and that there is strength and power in the sheer number of youth voices in this fight. Though perhaps historically excluded, youth are indeed stakeholders in regional issues of population and development and need to be included as decision-makers now more than ever. Read on to learn more about his experience representing GOJoven Guatemala in Lima in his own words! If you want to read more about the CPD Meeting and the participation of other GOJoven Associations and GOJoven Fellows, see our overview blog here. “The Youth Political Leadership Camp: Youth Now! 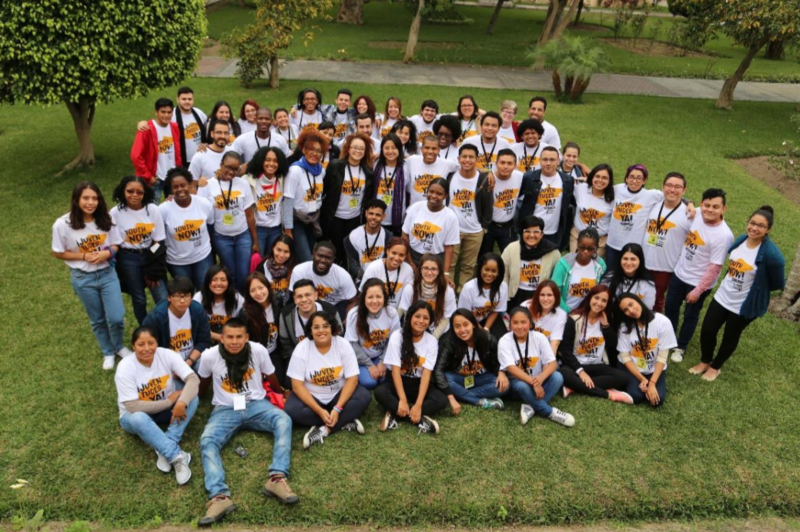 was a space for young leaders from twenty-eight countries in Latin America and the Caribbean to gather and meet. In this space, we participated in many learning processes that contributed to our leadership skills, and shared what work we were doing in our countries back home. There were four days of pure learning, of deconstructing adult-centered structures that deepen stereotyping of youth as merely biological entities and do not recognize that, in reality, we are political bodies with the capacity to defend our needs, our territories and our own bodies. “The feminist dialogues were especially thought-provoking, during which the women participants shared their experiences in struggles that I do not see every day but clearly exist and affect them. It was very moving to hear about how they fight against these systems that do not acknowledge their political, cultural, social and sexual identities. Now, I believe it is important to continue creating these spaces, as much as we can. One of my biggest takeaways is recognizing that the struggles we face as youth unite us, and it is wrong to discount us as “only youth.” We need society to see us as decision-making entities in all political spaces. It was time for us to see that these systems bind us to a perpetual cycle of exclusion, and we should change that. “After four days in the youth camp, I was able to attend the Regional Youth Forum (another pre-CPD event). In this space, all youth from Latin America and the Caribbean met to make our own pronouncement and read it at the Third Regional Conference on Population and Development. We worked in groups focusing on the different Priority Measures of the Montevideo Consensus, and I immediately joined the group addressing Sexual Rights and Reproductive Rights, though there were many other topics like “Rights of Indigenous Peoples”, “Immigration”, etc. At my table, everyone mentioned actions that we would like our governments to take in order to improve the quality of life of children and young people in our countries and defend their sexual and reproductive rights. We also mentioned how our governments have clearly violated these fundamental rights and gave examples of public policies they’ve implemented that did not guarantee them. By day’s end, we had finalized a formal pronouncement that would be read during the Conference. It was very exciting to know that we all were advancing different agendas that intersect and overlap, like the roots of one tree with another. “Finally, we arrived at the official Third Meeting of the Regional Conference on Population and Development of Latin America and the Caribbean, where government representatives from each country give national reports on their progress in implementing the Montevideo Consensus. Created in 2013, this Consensus is a tool for governments, in partnership with civil society, to continue to advance human rights. On the first day of the conference, I was able to hear the national reports, where each country’s official representative presented on the progress their country had made, as well as the challenges that yet remain. Some people were not satisfied with their national reports because, in reality, the country had not made much progress in implementing what was called for in the Consensus. Also, the formal pronouncement that we created in the Regional Youth Forum was read by a fellow young woman leader from Guatemala. As youth leaders, we felt empowered to be in front of our governments and address the needs of our countries, as we see and experience them. “On August 8th, the second day of the official CPD Meeting, I was able to attend the Central American Forum, where conference attendees and UN leaders discussed the situation of each country in relation to sexual and reproductive rights. I think it is important that young leaders have access to these spaces to vocalize their reasons for fighting daily against the political systems that prevent their attainment of these rights. 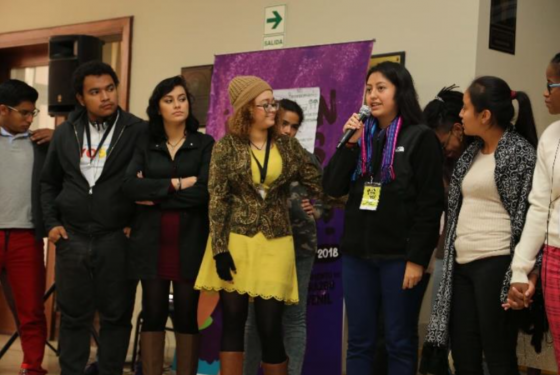 One fellow youth participant expressed her anger at the fact that Emergency Contraception is prohibited in Honduras, preventing access for girls, teenagers and young people when they really need it. These types of policies demonstrate the influence of religious and other traditional, non-rights based groups in our governments This happens not only in Guatemala, but also in countries all over the region. Despite these hard conversations, I felt safe in this space because we were united in a common struggle. It was clear that Central America’s political environment is difficult to navigate and that we will continue to face pushback until we take action based on our agendas and movements.